It's hardly a shock, but Michael Jackson is dominating the digital downloads market following his death last week. Jackson – who died of a heart attack last week – has immediately become a massive fixture in top 10s, with the Apple iTunes' rundown page a great indication of what is happening on a global level. 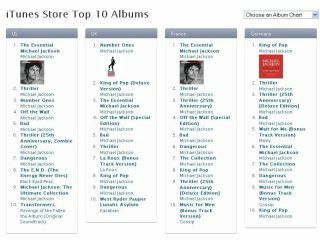 A look at the Album sales sees eight out of the Top 10 filled with Michael Jackson albums, with greatest hits compilation Number Ones filling top spot. The US also has eight out of the ten album slots filled by Jackson, while France goes one better, with only Music for Men by Gossip keeping the King of Pop from a full sweep. In the singles charts on iTunes, the UK surprisingly has Bulletproof by La Roux ahead of Jackson's Man in the Mirror, which tops the US chart. Luxembourg's chart is topped by Michael Jackson's Earth Song – which probably speaks volumes – while Ireland's iTunes chart contains no Michael Jackson songs at all.